« Regent Sounds Website up and running. 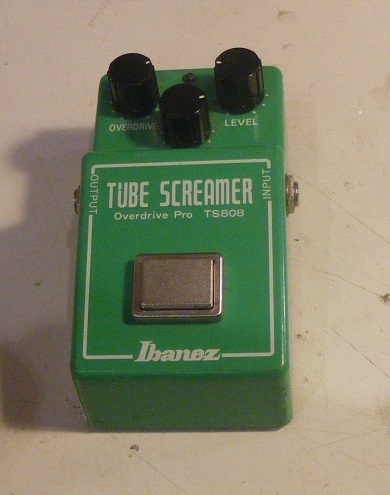 The Ibanez TS-808 Tube Screamer is, rightly, regarded as a classic pedal, and has been reissued by Ibanez; this is lucky as an original TS-808s will set you back several hundred pounds. Unfortunately the switches on the reissue (and indeed the originals), are not that robust. This pedal came in with a broken switch. In the past I have simply replaced the whole switch assembly; however I had run out of TS-808 switches and the only replacement I could find for sale was in the US and $20, which would have made the repair expensive. 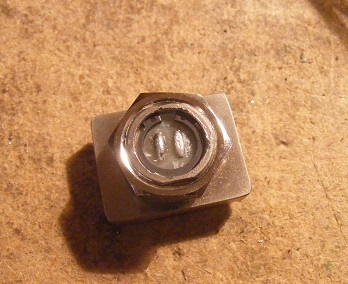 I thus investigated whether I could repair the switch, so I removed this from the pedal and disassembled it. 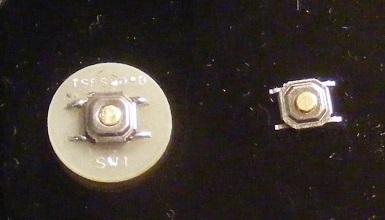 On the left we have the defective switch, which was stuck on. Amazingly I was able to source a replacement, which is an inexpensive surface mount momentary connect switch, and it was a simple job to swap out. Here’s the final switch assemble ready for reinstallation in the pedal. Total cost of the repair £23, which is almost certainly less than the cost of ordering the switch from the US! This entry was posted in Effects pedal, Effects repair. Bookmark the permalink. Post a comment or leave a trackback: Trackback URL.